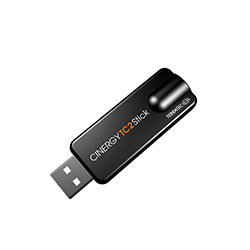 The TERRATEC CINERGY TC 2 Stick is the product portfolios all-rounder. The compact device receives TV signals via DVB-C, DVB-T and DVB-T2 (H.265). It can be connected to the PC via USB and brings the TV program on the screen directly. Favourite movies can be saved on the PC with the direct recording function or previously be programmed with EPG. Tele text belongs to the scope of functionalities as well.